Here each column_name is an index. (Actually a sub index of a composite index. 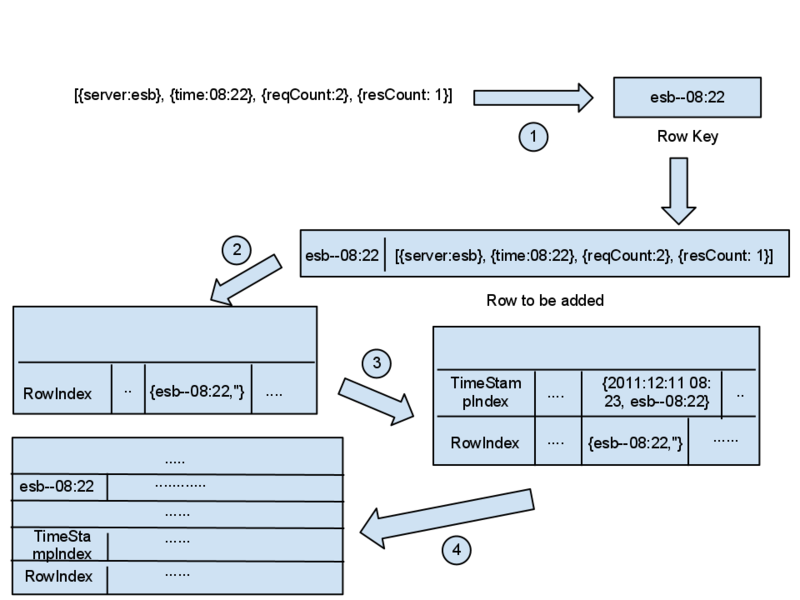 For a description on our indexing scheme refer to my earlier blog Cassandra: Lessons Learnt) . So our use case is bit complicated in that it’s required to paginate the access of the result set obtained from a range query. Also our requirement was to fetch all the rows satisfying this criteria without missing any row provided that there would be new additions while we are retrieving rows in batches. In fact there may be a considerable time-lapse between two fetches since the retrieved data are processed using a scheduled task with configurable interval in our use case. Additionally we had to leave the room for non batched access of the range query result as well. And of course we were not using the OrderedPartitioner. (Evils of OrderedPartitioner is well documented elsewhere. Sub optimal loadbalancing, creating hot spots etc.. ). Had we used OrderedPartitioner our life would have been bit easier since we would have been able to do a range query on the rows. But since we were using RandomPartitioner no ordering of rows using row keys can be assumed as well. First we had to deal with our inability to do range query on rows. Cassandra has this nice caveat, that columns of a particular row is always sorted using the column keys. So we utilized this nicety to impose an ordering on rows. We always maintain a meta row in which all the row keys are stored as columns. (Actually a row key is a column key and column value is empty). Let’s say this row is ‘RowIndex’. (See figure 1). Now when doing a query on column family we first query this row using a range query and get the rows matching the criteria and then do the real row fetching one by one using the row keys fetched. You might be wondering how the range query is constructed to match the where clauses in the given SQL above. In our scheme the row key is constituted from concatenating the value for each index. (Index is in fact a column in a particular row and we use the column value as the index value. This will become clearer by having a look at the first step of illustration given in figure 2). 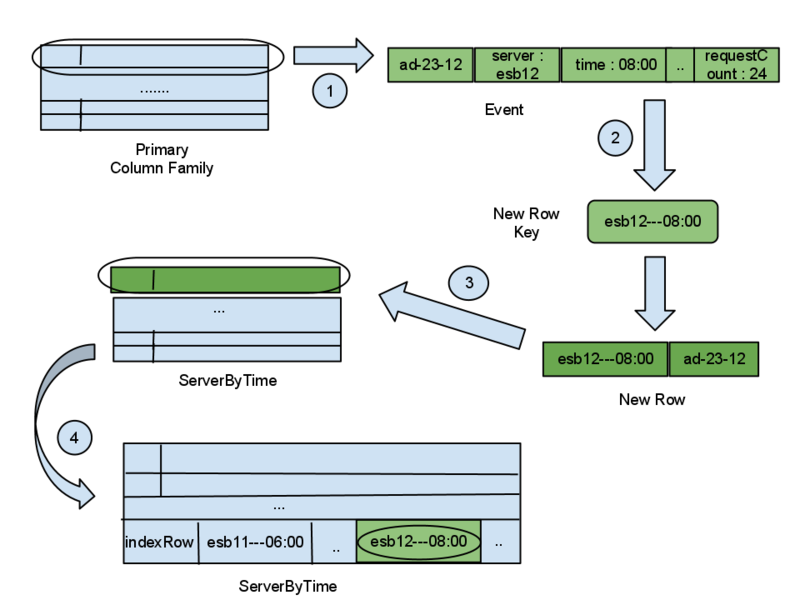 So this is the scheme we used for non batched retrieval of rows satisfying a particular query. Now the range first value of the query would be ‘esb—08:00’ and the range last value would be ‘esb—09:00’. 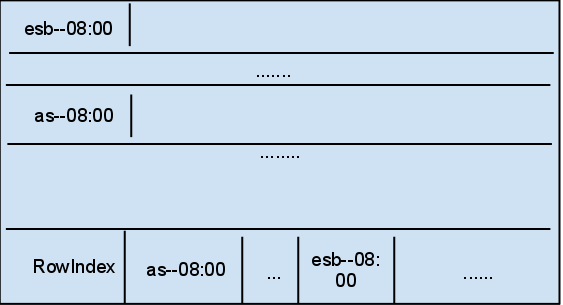 This will select events for server ‘esb’ during the hours from ’08:00′ to ’09:00′. So if the row key is ‘esb—08:23’ it will get picked and if it is ‘esb—09:23’ it won’t.